A few years ago I was over at a friend’s house goofing around with their young daughter. We were playing this game where she would hide behind the couch and peek out from the top or the sides to “surprise” me. She was too little to understand that she needed to randomize her pattern a little more. She stuck to a strict left side, top, right side, top pattern. She popped out of the left side and I pretended to be scared. “AAAAAAA!” I know she was going to pop out from the top of the couch next so I quickly jumped up on to the cushions and cut her off in mid hop with my own “RRRRRAAAAHHHH!” I was quite surprised when she fell backwards putting a hole in the drywall with her head. Hah! I’ve put my head through a few walls. But the best “accidental door” was the drunk sailors playing at WWF in the barracks passageway – One extra double-sized doorway to go, thank you! I’d have loved to have seen them trying to explain that one to the Master Chief! I’ve not scared anyone badly enough to make one fall, though my habit of trying to walk quietly tends to mean I make people jump when they turn around and see me standing right there. Alternately, I get trod upon when they fail to turn around before stepping back. By the way, was the girl’s head injured beyond mild bruising? As for the little girl, how was she at the time, fine and dandy? For some reason, I have a fear of stretching my arms above my head when there’s a ceiling fan on. I’m not even all that tall. Now THAT’s more like the Biff we know and love – bouncing on a trampoline indoors. At least we know, from well over two years’ experience, that we don’t have to worry about brain damage – since I’m not sure there IS one in there. But now I can share Biff’s pain. Eh, drywall ain’t all that strong. I’m sure she’s fine. I’m sure your friend was thrilled to have a hole to repair though. I really like the touch that he set it up not only indoors but also under a ceiling fan. Wouldn’t his eyebrows get caught in the fan? Chris, you’re such a jerk. Ha ha ha, but I’m just kidding. Brickface, I don’t think the fan was on at the time. The girl was fine. She was just confused by the horrific look of shock on my face. You, sir, are a golden god. Put that little munchkin right in her place! I wonder if Biff used to have a brain? I accidentally put my whole lower body through wallboard at my church once. And it’s actually amazing how little kids recover from some of the scariest looking things. My Uncle told me he was horrified when he saw me running on my family’s set of wooden chairs in the livingroom when I was little, and that I slipped and fell. I apparently hit my head about 3 or 4 times on the way down. I was okay afterwards, but that would have definitely freaked me out to see. He warned me about that and everything, too, so he didn’t just watch this happen. Those trampolines were such a tease for me as a kid. Mom wouldn’t let us have a real one, and we did have an exercise one, but compared to a nice, big one…. I’ve scared someone so bad that she tried to push me down but the floor was slippery and she had socks on so she wound up pushing me and then falling. Reminds me of that one time I got a concussion. I was playing on my brothers friends basement stares, there wasn’t any rails on the stares, so we like to jump off them. I lied on my stomach, only to find that I was stuck. There was only one way I thought to get down, so I leaned forward, and fell head first, on a floor that was cement with carpet. I missed the first 2 days of kindergarden. I love child injury stories. I did that with a kid I was babysitting around 15 years ago… I was flipping them over a couch and my aim was off for the fifth attemt. The poor kid ended up conking his head into the wooden armrest, and wouldn’t stop crying until he talked to his mom. He was fine, but it was very nerve-wracking. I hit my head on a TV yesterday…. Why does this remind me of the many times Ive rammed my head unintentioanlly on things that broke alot? Like the cupboard, and the wall, and someones head. Id be okay, but Id end up doing a lit more damage to the other person or thing than to me. I wonder if I got a few of Biffs genes………………. I’m only 5′ tall and have yet to fear low hanging objects and ceilings. The ground is my enemy. Yesterday, I got in a fight with the dirt. It was tired of me walking all over it and I was tired of it catching my feet with its rocks. I lost. I remember when I was running around the house at a young age and broke the glass window of the front door. The strange thing is that I broke my arm only two hours later. things I broke with my head a door, a car window, the wall several times, ribs, hinges, thin cement, a wagon wheel chandelier (it fell) and a tree branch so eight things and I live of coarse I think I have billygoat somewhere in my blood………. I just started reading Biff today, and I (somehow) got through all 500+ today! These are great man, you should get them published in a newspaper! I don’t think I’ve EVER broken a wall or ceiling. I did break a glass EVERY YEAR though, at every gathering, I would either drup, bump or step on a wine glass. It got to the point that I would burst into tears every time it happened. Then one year, someone else broke a glass and the curse was broken. @ Alcadeius, yeah…I think I have a bit more of an excuse. I’m 5’10”. I’m sorry, I’ve made several comments to this one, but I promise this is my last! Sternocleidomastoid is a neck muscle. Also, it would probably be wise to put your trampoline outside. If that were to happen in my house, she would just be crying, with a bleeding head. My walls are made of concrete. I think. They’re pretty hard. I can’t punch through them, no matter how hard I try. Yet, they’re not very sound proof.. I just want to know why you are testing the strength of your concrete walls by punching them. @ Joe: I have a cool scar too. Iwas riding my electric scooter & I ran over 2 potholes and I went flying off. I skidded for about 20 feet on my head & my scooter kept going. i scraped up my arms & legs but I was wearing a helmet so no head damage unlike a certain large-eyebrowed friend we all know & are disturbed by. I only just now noticed that one of the fan blades is broken. There were 4 cupboards, two above and two below. The lower left was mine. The problem is that the upper left tended to silently swing open when you opened the lower. After a few moments the world stopped pulsing and I was able to get to my feet. I visited a cousin once, and he was vacuuming with headphones and didn’t hear me coming. So he turned around and saw me and literally jumped a foot up and collapsed on the bed behind him. The most I’ve scared someone and I didn’t even try. . . Unlike that time a friend was home alone on a dark winter night playing DOOM on the Playstation. I saw him through the window when I came on my surprise visit, and crawled in through the dog tunnel and sneaked up and stood behind him silently. Waiting. I didn’t have to wait long. If you know Doom, there’s a lot of places where monsters jump out behind you, so I waited for one of those and then I put a hand on his shoulder and growled. 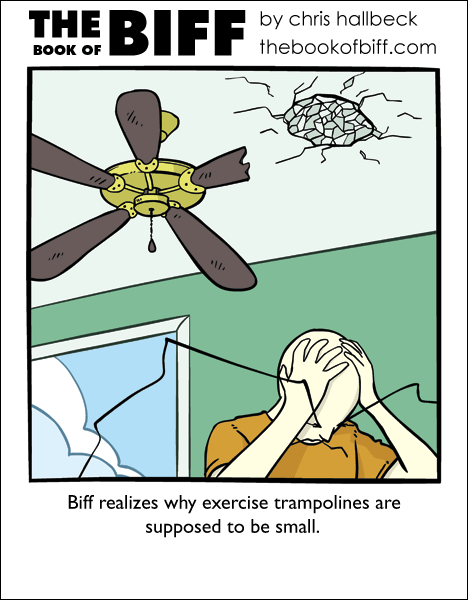 Wow, this comic just might prove that Biff does actually feel pain!